I was in Wegman’s market looking for raspberry oranges a type of blood orange that I love. It is the only place I can find them, and they are my favorite citrus. Alas, they had none. I did find a lovely bag of blood oranges, however. I bought them, knowing I could never use them all, so after a day or two, I knew I needed to cook them. I decided to make some old fashioned, thick-cut bitter English marmalade. 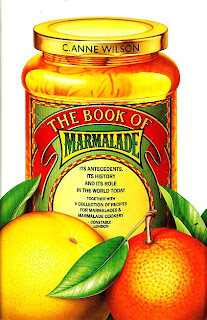 It was the Portuguese who gave us the antecedent for marmalade with the word for quince, marmelo, a name that stuck to the thick fruit pastes they exported. The bitter Seville oranges of Spain were considered unusable until the English began importing them for their marmalade. The food historian C. Anne Wilson tells us in her history of the confiture, The Book of Marmalade: Its Antecedents, Its History and Its Role in the World Today, Together With a Collection of Recipes for Marmalades & Marmalade , that the first printed recipe for a bitter orange marmalade was that of an Englishwoman, Mary Kettilby, which appeared in 1714. But the pulp did not have the characteristic chunks. In the 1790's, Janet Keiller, wife of a Dundee grocer, who first made the chipped, pulpy marmalade, including "chips" of peel in her jam. Her husband bought consignment of cheap oranges from a storm-tossed boat. Mrs Keiller used sugar from her husband's store to produce the marmalade that made England famous. Alas, Dundee's is made no more in Dundee, having been swallowed up, like toast, by giant conglomerates. In an article in the Independent, Michael Bateman lamented the fact that it was getting harder and harder to find true English marmalade, unless you made it yourself. Now, England is becoming more and more “American” in taste. As companies farm out their marketing to focus groups, marmalade is growing sweeter and sweeter with a more jelly like consistency. Well, I wanted that thick-cut, tart taste that stays with you hours after your morning toast. 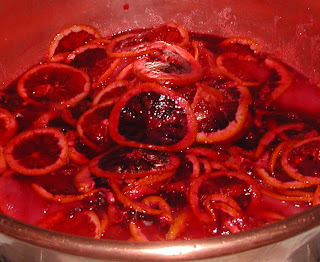 Slice the blood oranges over a preserving pan, throwing away the fleshy stem slice. (The easiest way to slice them is with a mandolin.) As you slice, remove any noticeable seeds. Add the lemon juice. Pour sugar over the sliced oranges. Let the pan set for at least and hour as the sugar draws the juice. Bring the pan to a steady simmer and cook for about an hour. The mixture will reduce by about 1/3. Skim off any foam that may float to the top. Check the orange peel for doneness. You should be able to easily cut into the peel with a spoon. Bring the fruit mixture to a rolling boil for 7 to 10 minutes. 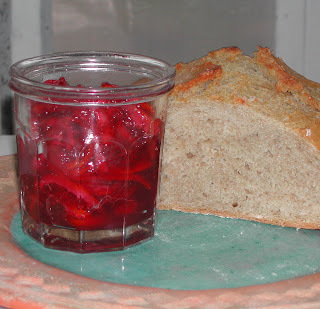 Do not step away from the confiture pan at this point! 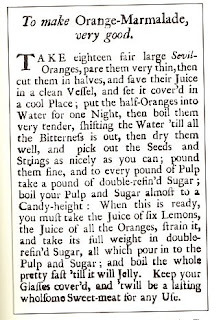 Allow the marmalade to sit for ten to fifteen minutes to settle the peel, otherwise it will float to the top. 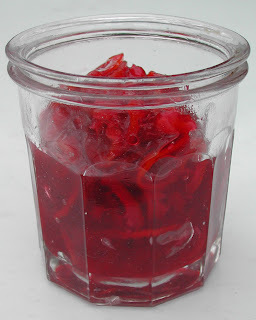 Ladle the marmalade into prepared, hot jars, seal with lids, and invert on a cloth towel. Allow to sit for 5 –10 minutes before righting the jars.